A card trick with a legendary history. 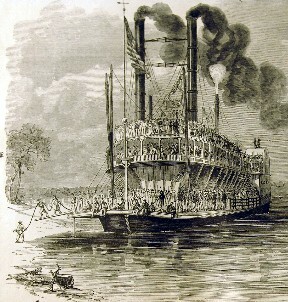 It all started on the Mississippi when the big paddle riverboat was queen of the river. Riverboat Gamblers would entertain (and swindle) the passengers on their slow journey. The Riverboat Gamblers created this unique shuffle. But it was more than just a shuffle, it was a way to secretly stack the deck in their favor. Now their secrets are being passed onto you. Just like the Riverboat Gamblers, you use any ordinary deck of playing cards. You can even use the spectators deck if they have one. But the presentation is anything but ordinary. Once you start you don't touch or handle the cards in any way. The spectator does all the card work! Everyone is totally shocked when the unskilled spectator flips over the top card on four stacks, and each stack has an Ace on top. And in the end the spectator has not learned a trick at all, they have only been tricked again. They won't be able to repeat the effect. A great effect when someone begs you "come on, teach me a trick". Requires very little skill. No fancy finger flippin'. You get complete instructions with photographed illustrations. And you get a great story line (patter) to draw them in. The Riverboat Shuffle comes complete in a .pdf file format. The file will be sent to by email.